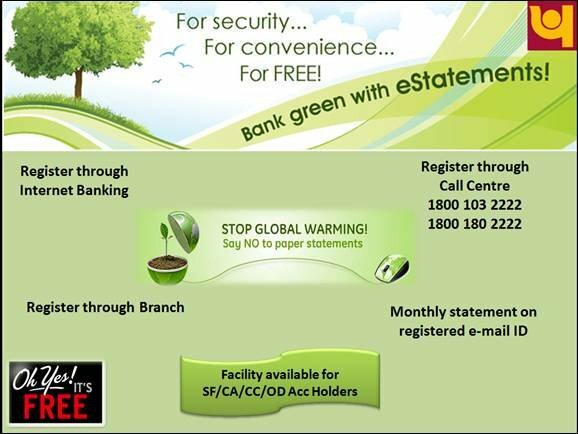 Punjab Nation Bank (PNB) has started e-Statement Facility, to reduce the consumption of paper. PNB e-Statement Facility is environment friendly and free of cost service which promotes to protect more trees from being destroyed, so to save your environment register your account for PNB e-Statement Facility. So below are the steps which will help you to register for PNB e-Statement Facility. There are numerous methods to get register your account for PNB e-Statement Facility and below we have mentioned them all. Register for PNB e-Statement Facility through Internet Banking: If you are having PNB Net Banking Facility enabled than you can simply login to your Internet Banking Account navigate to General Services > Service Request > New requests > Email Statement Registration and register your account for PNB e-Statement Facility. Register for PNB e-Statement Facility through Call Center: To register for PNB e-Statement Facility by through Call Center just call 1800 103 2222 or 1800 180 2222. Register for PNB e-Statement Facility through Branch: You can even register for PNB e-Statement Facility by visiting your bank branch. Once you register your account for PNB e-Statement Facility you will receive monthly statement of your account on your registered email id. By this you can enjoy easy access to your account statements at the click of a button, anytime and anywhere at your convenience. have me registered for email statement on internet, please.